How do I get the top menu to overlap the sidebar menu? What should z-index of menu underneath be? What z-index numbers should I use for other menus in descending order? 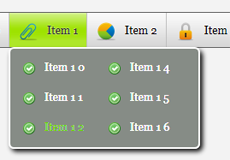 October 05, 2012 Is it possible to make all css web menu submenus open from right to left? I have created a horizontal menu with submenus. September 27, 2012 Can I use vertical css menus both on Windows and Mac? I bought your the software CSS3Menu version 3.3.0.0. I would write to you because I have problems when menus are installed. IE8 problem: the titles are cut up menu (see screen-copy) and responsive menu does not work on IE8 ..